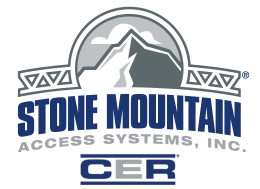 Stone Mountain Access Systems has an Authorized OSHA Outreach Trainer on staff for this training. The OSHA 30-hour class is intended for supervisors or workers with some safety responsibility. There are some portions of the training that are considered electives and you are encouraged to get with our Authorized OSHA Outreach Trainer to custom design your course. The OSHA Outreach Training Program for the Construction Industry provides training for workers and employers on the recognition, avoidance, abatement, and prevention of safety and health hazards in workplaces in the construction industry. The program also provides information regarding workers’ rights, employer responsibilities, and how to file a complaint. Class sizes range from 10 to 40. OSHA training is not required by OSHA none of the courses within the Outreach Training Program is considered a certification. This training has no expiration date, but we encourage students to take refresher training every few years as the standards and the courses themselves are change over time.